What things do you do to be more environmentally conscious? Many families recycle, turn off lights when leaving a room or turn off the faucet while brushing their teeth. There are so many ways to make a positive impact on the environment from our homes, but did you know you can make an impact even during a home remodel? 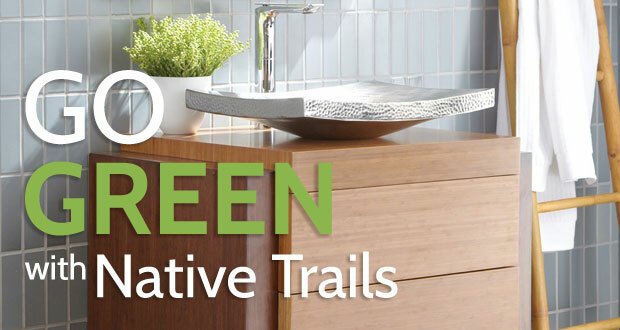 With Native Trails, you can acquire high-quality design pieces crafted from recycled natural materials. Located in sunny California, Native Trails infuses quality in every sink and bathtub design with the combination of artisan craftsmanship and natural, sustainable materials. Whether using recycled copper or reclaimed wood, each piece is handcrafted by skilled craftsmen who use age-old techniques to bring out the natural beauty of the material. The reclaimed wood used in the bathroom vanities, storage and mirrors originate from old barns and wineries on California’s Central Coast, while the copper is melted, poured and hammered for a truly unique piece. Inspired by communal sinks used in early indoor plumbing, these trough sinks come in a variety of sizes and materials, such as copper, to add an interesting feature to a bathroom remodel. In 2014, Native Trails released their NativeStone Collection, which uses an innovative mixture of jute fiber and cement. Sinks from the NativeStone Collection are stain-resistant and weigh almost 40% less than other concrete sinks. With several vanity collections, Native Trails has a style for everyone. For those looking for a bit of class, Vintner’s Collection is perfect, with Cabernet and Chardonnay vanities made from reclaimed winemaking oak staves. The Americana Collection captures a bit of history in every design with wood refurbished from structures of the past. For those looking to the future, a rejuvenated space is easily achieved with vanities from the RenewalSeries, which uses the beauty of natural bamboo. Native Trails offers two kinds of copper tubs, Aspen and Aura. Made of recycled copper, each style takes thousands of hammer strikes to create, meaning every tub is unique. Both designs are great for long relaxing soaks while providing a beautiful focal point in the room. Using natural materials is also beneficial for cleaning. In most cases, simply using mild soap and warm water will be enough to clean the surface. In fact, the sealer used on the copper products and NativeStone sinks is self-healing, allowing stains to fade and eventually disappear within a few days. Native Trails truly combines the beauty of natural materials with the art of skilled craftsmanship. If you are looking for interesting pieces for your home, look no further than Native Trails.